Sue Blacker is well known to wool enthusiasts as she has a hand in the whole fleece to garment process from start to finish! 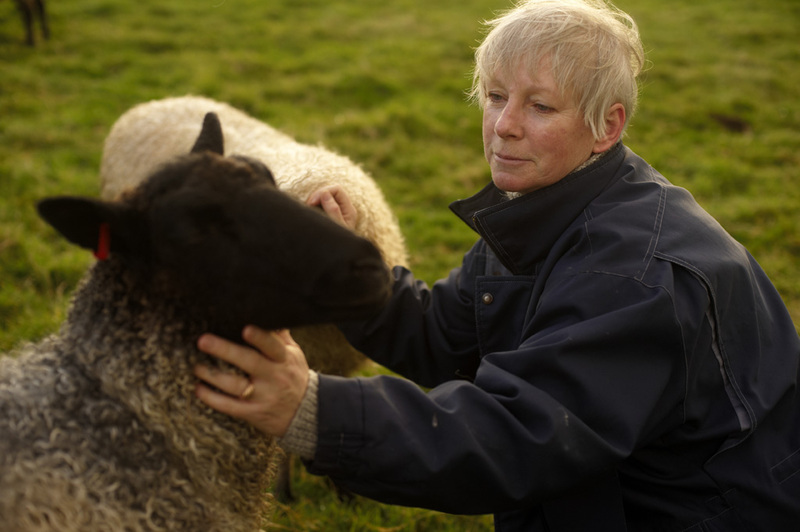 In running The Natural Fibre Company she works with many woolgrowers who get their fleeces spun there; as a knitwear designer she actively raises the profile of our British sheep breeds and empowers knitters to find new ways of utilising the characteristics of their varied fleeces; by instigating the Woolsack project, she endeavoured to raise the profile of British Wool in the International Context of the Olympic Games, (a project which has been largely run since by Jane Cooper, from whom we’ll hear later in the month); and as a shepherd, Sue keeps close to the source of the wool that she deals with in all her other work. For WOVEMBER we thought it would be nice to share some glimpses into Sue’s work with her sheep across the month. We have gleaned from Sue’s blog some glimpses into life with Gotland and Bluefaced Leicester sheep, and our findings will commence with lambing time, as a follow on from the tupping time mentioned at the start of WOVEMBER. 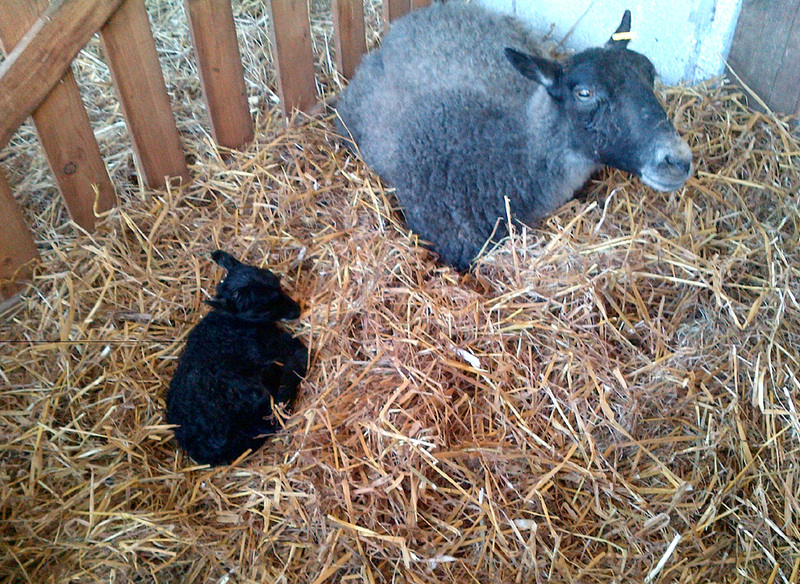 31st March, 2012 – Lambs are here! 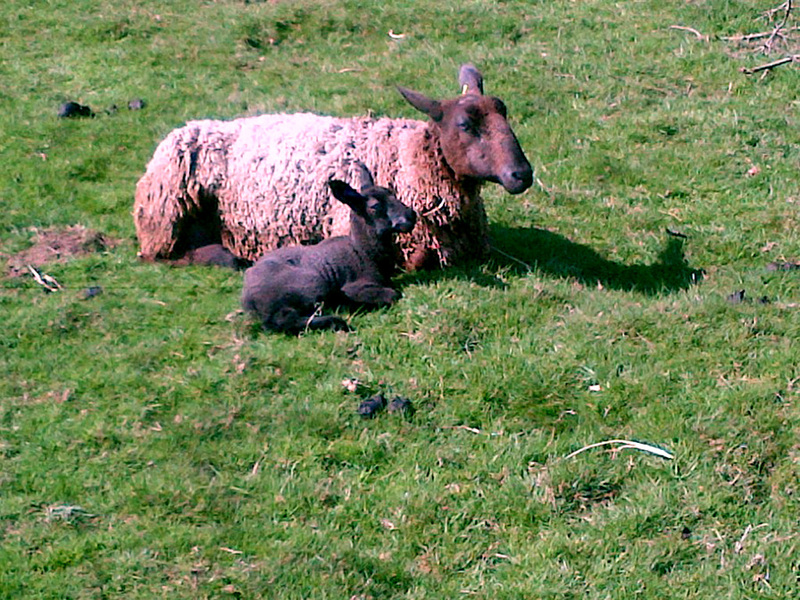 7 lambs so far from 5 ewes – half-way there! Mainly Blue-faced photo’s so far, but one Gotland! 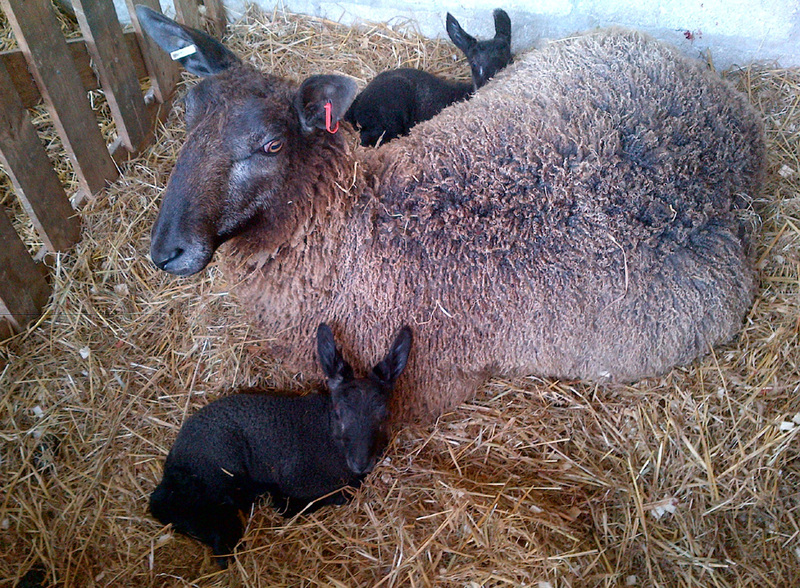 Jupiter was clearly quick off the mark as all three black Blue-faced Leicester ladies, Juno, Venus and Minerva, have lambed – and all the lambs are black too, which is excellent. I have been reading a very good article on colour in Wensleydales by Dr. Jeanie Muddle and discover that I should expect pretty much 90% dark from dark parents, so this is good. We have 1 single (Apollo) and 2 twin rams (Romulus and Remus) and 2 twin ewes (Maia and Flora) and all are big strapping things – a bit like shire horses compared to the much smaller Gotlands! The Gotlands number 1 single ram (Thor) and 1 single ewe lamb (Freya) each from Diana and Emily (whose proper name is Mathilda), and thus also from Jonathan and Sonny. 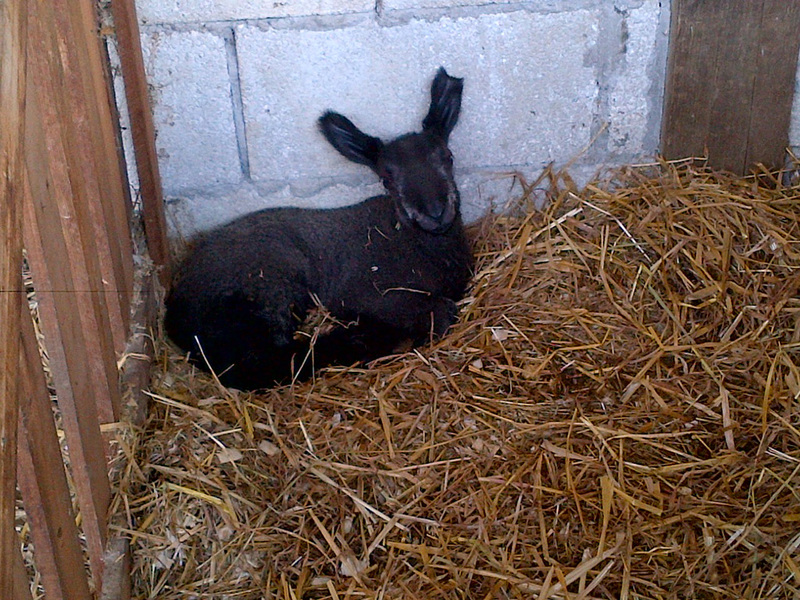 So we have 5 Gotland ladies left to lamb, including Sixpence who will have a cross-bred lamb out of Jupiter. 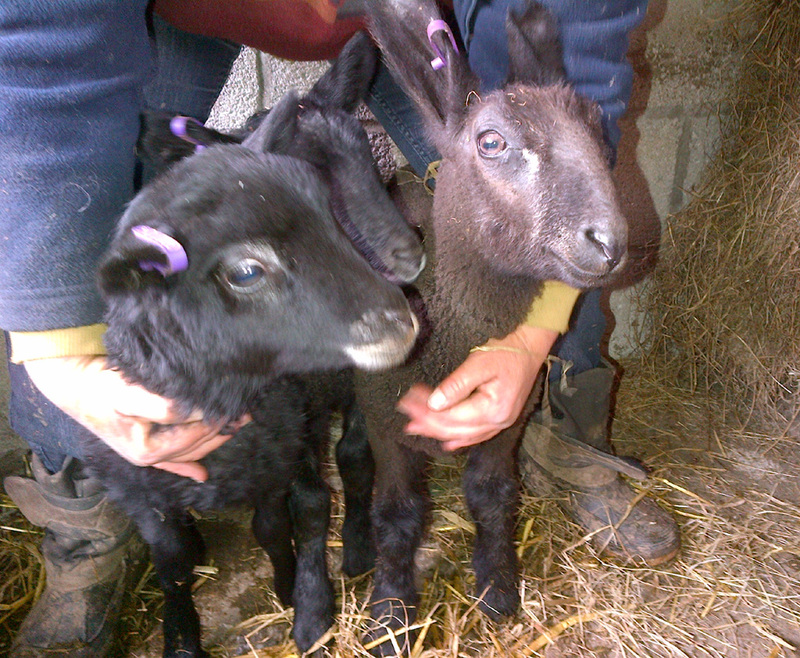 Sixpence and Sylvia look as if they will explode or lamb soon, but have looked like that all week …. while Grace and Sally look less ready and I am not sure about Penny still, as she had a bad abscess on her leg which may have terminated her pregnancy, though Emily surprised me (she had a badly cut knee and was pretty thin but a day of pen-rest seems to have done the trick). As the BFLs are all Roman, because of their noses, I have decided on Norsk names for the Gotlands this year! After a day of “mothering-up” in the lambing pen, the lambs are tagged (one tag only for now as the electronic ID tag can be done later), have long tails ringed and, if necessary, the rams are castrated with rubber rings, too. One of the Blue-faced Leicester ewes, Minerva, has a long tail still and it does get pretty dirty so, although I try not to intervene too much, I decided to dock the lambs, but not too short as tails are useful to brush away flies and keep out drafts. I am also keeping the ram lambs entire this year, partly because I need some replacement rams and want to see how they develop and partly because the big ones will go for meat in good time if not selected as rams anyway. Also I hate doing it! So now we have all this week’s crop of lambs out in the field with their mums and the rest of the girls, so there is general mayhem and disorganisation at meal times when the mums rush in for food and then worry about which lamb is which – the Gotland lambs seem much more likely to walk to heel behind their mums than the BFLs, but this may be just because the BFLs are a couple of days older. So we have 15 lambs in all, 5 Blue-faced Leicester (3 boys and 2 girls) and 10 Gotland (2 boys and 8 girls), which is pretty pleasing. We lost just one, which was the second to be born but was not coming out without help. 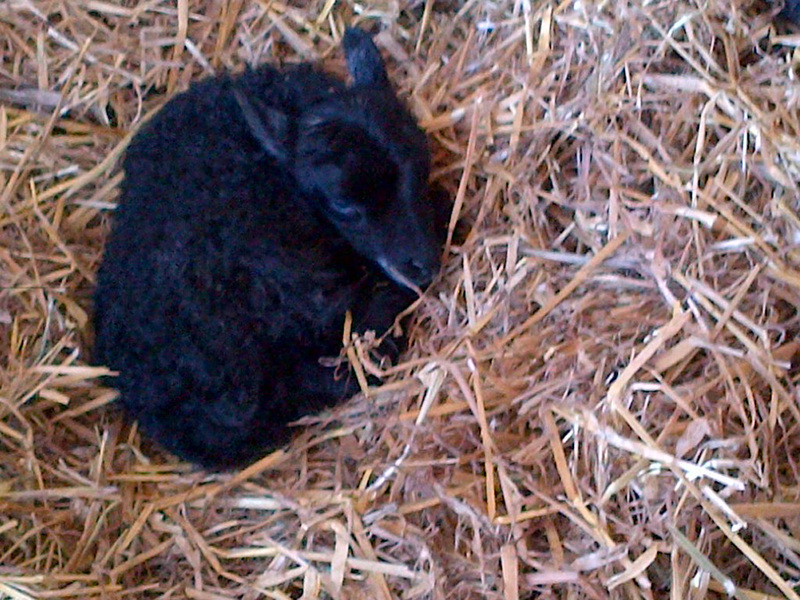 By the time we managed to extract him, it was too late, but his mum seemed OK as she already had one little ewe, Misty. 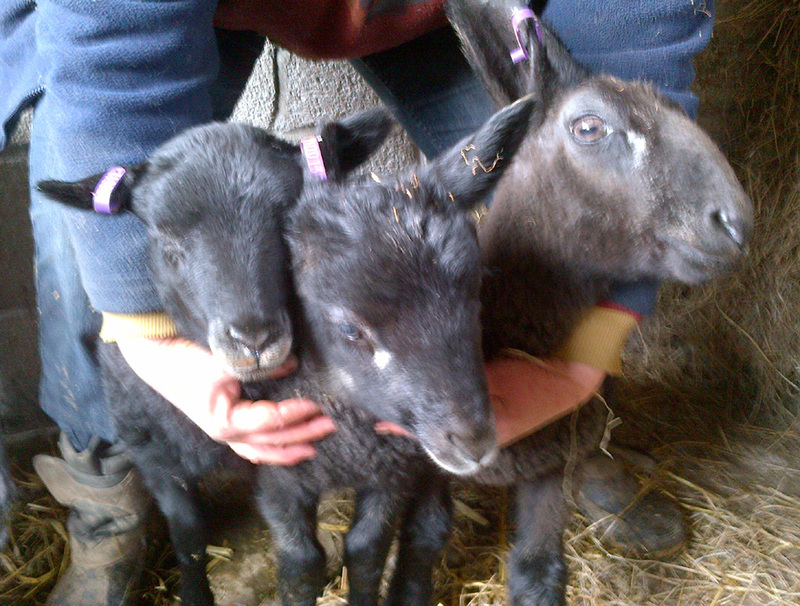 Here are pictures of the heads of 3 ram lambs, held by Kay Walker who lookers my sheep for me when I am away. 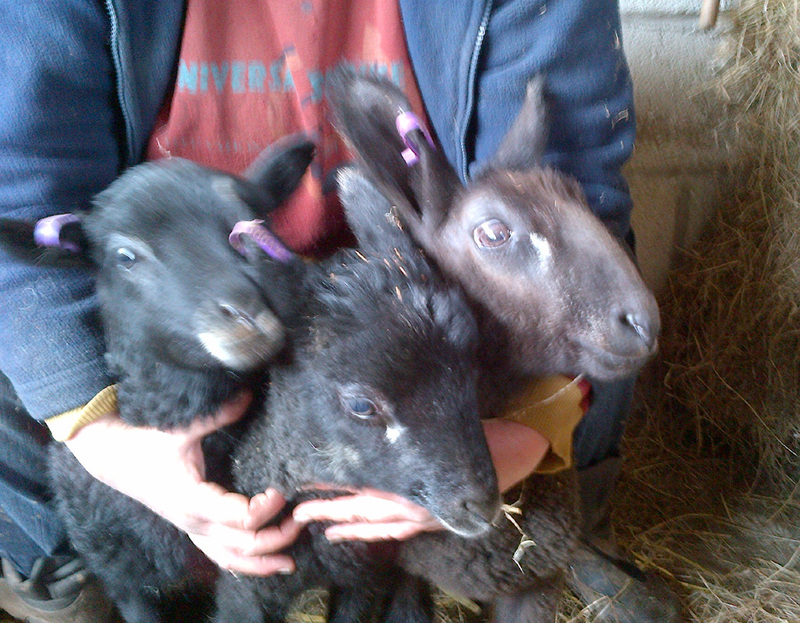 The left-hand one is pure Gotland, the middle one is BFL ram on Gotland ewe and the right-hand one is pure Blue-faced Leicester. 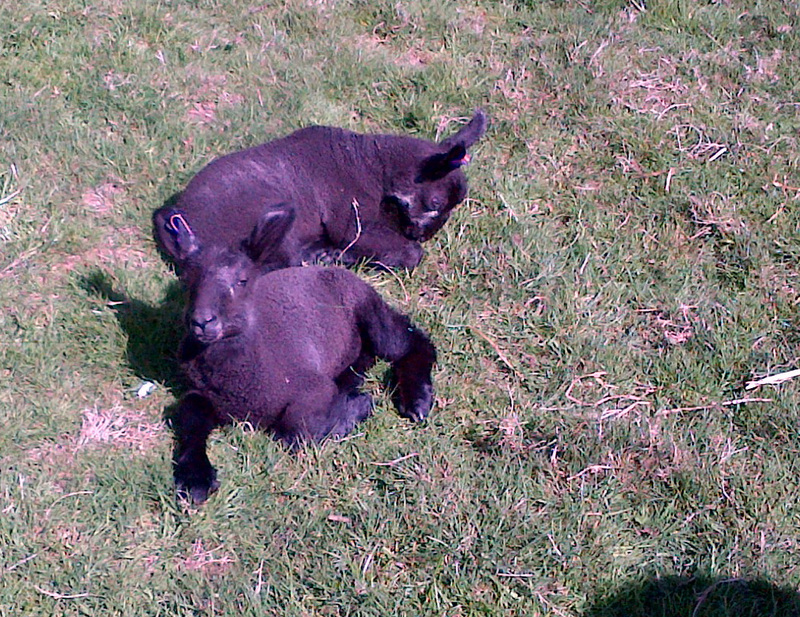 The cross-bred lambs are interesting: they have a dark/grey/black fleece (Gotland) but with BFL crimp (so far) and they have more Gotland heads than BFL, lacking the highly ridged nose shape, but they do have BFL-style ears. They also have the white “tear” marks below the eyes like the BFLs and also the Gotland white chins! They are larger than Gotlands but not as big as the increasingly beefy BFL lambs, which are now nearly as big as the smaller Gotland ewe lambs, and certainly will look larger in comparison once we shear later this week – if Gideon is free …. As the two cross-bred were boys, I have castrated them so I can see progress and preserve the wool quality for a longer time, so we shall watch this space! This does mean that their head shape will remain more lamb – or ewe – like and will not develop into a battering-ram style! Interesting – another word with a sheep origin! I was also interested to discover that, of course, the word bummer comes from the sheep world too. Those greedy lambs who sneak up behind ewes to grab some milk from the back, rather than from the front under the leg, are called bummer lambs because they are bumming a free ration! Now to Misty! She has a triangular white patch on her head (most of them have few head markings this year) and also white patches on her ears. Her mother is Sylvia, who is pale coloured and also has white on her head. She was born on 1st April. After about a week, she seemed to be limping badly but there was nothing visibly wrong and no heat in the joints and she was just running around with her left front leg up all the time. After trying a bit of anti-bacterial spray there was no improvement so I took her to the vet. Taking a lamb to the vet is always fun as they attract a fair bit of attention in the waiting room, but if draped across a knee they generally doze off gently. Anyway we decided there was still nothing visible and no sign of a break, which is what I had feared, so after a further anti-biotic and anti-inflamatory injection (as a pain killer) we went home to an anxious mum. Since then, to my surprise, I am an adopted parent! She rushes to meet me and wants lots of cuddles and eats from her own special plate (my hand) or a bucket. Her mother, who was always tame, is also puzzled by this though willing to join in any extra rations if possible. Misty is still not quite right so I suspect there may have been a break and she will probably have an inwardly bowed front leg, but she is fine and growing well.